"The culture is getting meaner and meaner," Petty says. "If you go to artists or record-business people, no one thinks that it's them causing the problems. But it's all of us, in a way. The album is a statement about the declining moral values in society, and that we don't really care enough about each other any more." Only an artist of Petty's stature could dare make a record like "The Last DJ." When Petty speaks, people listen. That will happen when you survived 25 years in a fickle industry and have just been inducted into the Rock and Roll Hall of Fame. "The artists who have been around have got to take more responsibility for the power we have," says Petty. And "The Last DJ" has already sent shivers through some corporate boardrooms. The title track is a wake-up call: a fiery rock tune that defends freedom of choice for DJs, rather than their having to play songs chosen by anonymous consultants. "You can't turn him into a company man/You can't turn him into a whore/And the boys upstairs just don't understand anymore," Petty sings. It's really a "pro-radio song," Petty says. And even though some radio programmers have been shocked by it, the song was the most-added single at Triple A (adult album alternative) radio stations and rock stations when it was released recently. "When we first heard it, we said, 'Whoa, it's angry,'" recalls Michele Williams, music director at Boston's WBOS (92.9 FM). "But it's a Tom Petty song with a great tempo, and it tells a story. And when you hear it on the radio, it works. "Tom Petty is an icon of rock radio. When he puts out a new record, people are going to take notice of it. But I don't know if it's a wake-up call for radio. I think it will reaffirm in some people's minds what is already there. "This is not a new feeling in radio, ever since radio went through so much consolidation. But I don't think it will change things. Also, I think it's a commentary on business in general. not just the radio business." Petty says that he uses radio stations and major record labels as a metaphor on the CD for the "corporate nightmares" affecting many industries. But it's hard to avoid the specificity of the lyrics of another track, "Joe," about a cynical record-label chief executive seeking new teen singers to exploit: "Go get me a kid with a good-looking face/Bring me a kid who can remember his place. ... Or bring me a girl/They're always the best/You put 'em on stage and you have 'em undress." Then there's "Money Becomes King," a gutsy track about a singer named Johnny who doubles the price of his concert tickets, sells out to a beer sponsor, and plays to upscale fans who "sat in golden circles and waiters served them wine/And talked through all the music and paid John little mind/And way up in the nosebleeds/We watched him on the screen/They'd hung between the billboards so cheaper seats could see." "Rich people aren't fun to play to," says Petty. "You want people there who make average incomes, because they might appreciate it more. And a rock show is still just a rock show. I've never seen one that is worth $100." Petty, who keeps his ticket prices well below that, says, "Everyone seems so concerned with making as much money as could possibly be made. It used to be OK to turn a healthy profit, but you didn't have to take every damned dime you could get. ... It's completely accountant-driven now." 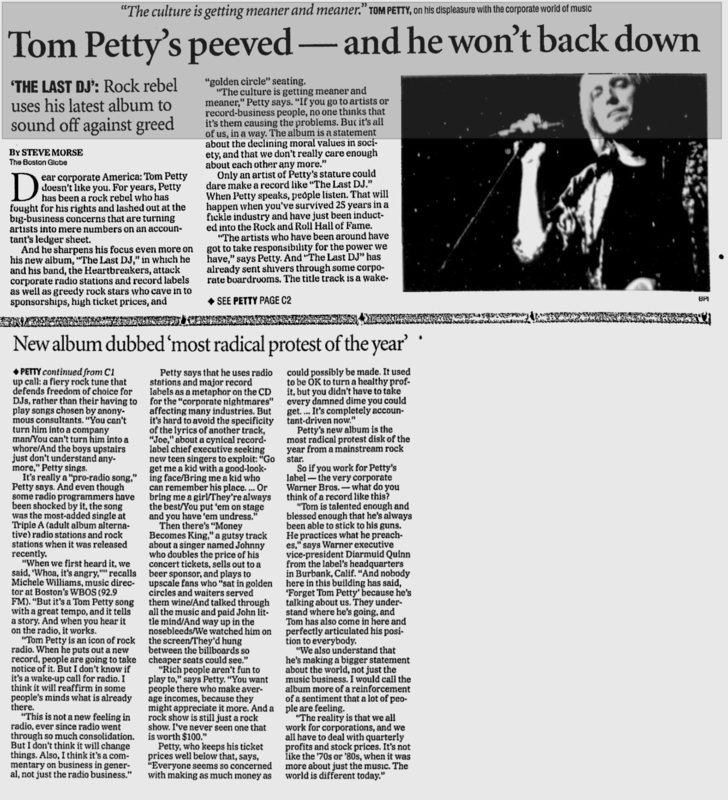 Petty's new album is the most radical protest disk of the year from a mainstream rock star. So if you work for Petty's label -- the very corporate Warner Bros. -- what do you think of a record like this? "Tom is talented enough and blessed enough that he's always able to stick to his guns. 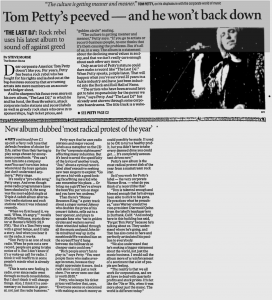 He practices what he preaches," says Warner executive Diarmuid Quinn from the label's headquarters in Burbank, Calif. "And nobody here in this building has said, 'Forget Tom Petty' because he's talking about us. They understand where he's going, and Tom has also come in here and perfectly articulated his position to everybody. "We also understand that he's making a bigger statement about the world, not just the music business. I would call the album more of a reinforcement of a sentiment that a lot of people are feeling. "The reality is that we all work for corporations, and we all have to deal with quarterly profits and stock prices. It's not like the '70s or '80s, when it was more about just the music. The world is different today."